I have a confession to make. The original title of this blog was “Google – success or failure”. However, at the last minute I changed it as it was not only wholly inaccurate, but also a gratuitous hook to get you to read on! The point I was trying to make was, that despite Google’s enormous successes, it has also had its fair share of failures. But let’s start with the positives first. As we all know, Google Search has a phenomenally large market share in most countries, casting its rivals aside with consummate ease. In the UK, according to Statcounter, Google owns around 90% market share of search, and in the US the figure is around 67%. 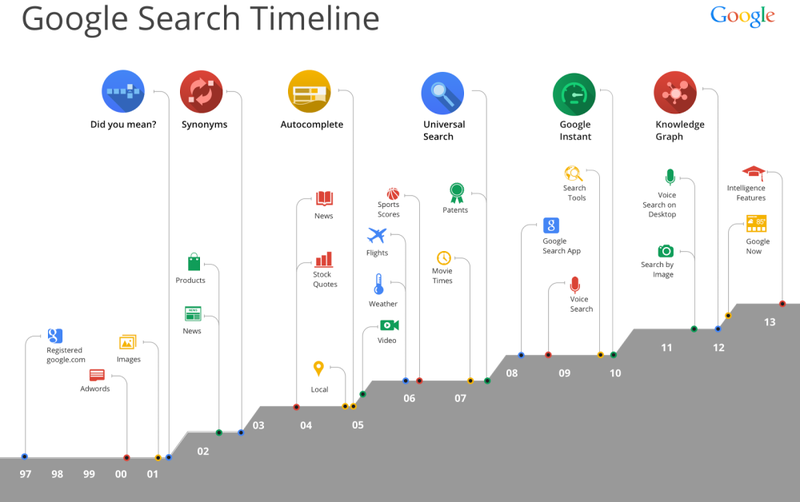 In 2012, Google generated US$50 billion in revenue, reporting a profit in the same year of US$10 billion – the greatest proportion from ad revenues. Billions of searches are carried out every day on Google. But that’s only half the story. Not only has Google been responsible for evolving the way we have searched for content over the last 15 years, but from a B2B perspective, Google has created a huge industry of satellite products and services: its brand and products have generated sustained income for a huge number of marketing related companies, be they agencies, software vendors and consultancies. And this is all in the space of 15 years. I’d call that a success! Google Wave – a real-time messaging and communication platform for teams, discontinued in 2010. Google Answers – an online knowledge market that allowed users to post monetary rewards for well researched answers to their queries. Shut down in December 2006. Google Catalogs – an application for tablets that allowed shoppers to browse and shop all their favourite catalogues in one place and enabled brands to annotate their catalogues with rich media content. Discontinued in August 2013. Froogle – a service that allowed consumers to compare prices of products; it was also free to merchants, enabling them to list their products by submitting a feed. Now rebranded Google Shopping and a paid advertising model to merchants. Google Print Ads – debuted in 2006, Google Print Ads enabled advertisers and agencies to plan and buy traditional newspaper ads via AdWords. Discontinued in 2009. Google Radio Ads – a service where Google strategically purchased all “dead” air-time from the major radio stations and resold it. Discontinued in 2009. Dodgeball / Google Latitude – a location-aware feature of Google Maps, developed as a successor to its earlier SMS-based service Dodgeball. Latitude allowed a mobile phone user to allow certain people to view their current location. Discontinued in August 2013. Web Accelerator – software installed on a user’s computer as well as data caching on Google’s servers to speed up page load times using data compression, prefetching of content, and sharing cached data between users. Discontinued in January 2008. Jaiku – a social networking, micro-blogging service similar to Twitter. Purchased by Google in October 2007 and subsequently discontinued in January 2012. Google Buzz – a social networking, microblogging and messaging tool that integrated into Gmail. Discontinued in 2011. Google Notebook – a free online application that allowed users to save and organise clips of information while conducting research online. Discontinued in 2011. Now replaced by Google Keep. Google SMS – a service allowing users to send search requests as a text message to Google and receive results back in SMS. Discontinued in 2013. Realtime Search – a feature where users could view information from sources such as Twitter, Facebook and news sites in search results, in real-time. Discontinued in July 2011. Whilst any successful entrepreneur will promote the concept of testing and launching new products or services – at least using the MVP (minimal viable product) philosophy – in my personal opinion, the above list stretches the boundaries of this concept, begging the question how much budget and resource was wasted in the bulging Google product archive? But irrelevant of its product successes and failures, Google has stuck to its brand basics and has managed to combine brand consistency with flexibility throughout its relatively short life. A great example of this is how Google has successfully collaborated a world of local and global ideas through Google Doodle, winning friends politically and universally. Its brand values have pervaded throughout the vast majority of its successful products by way of simple user experience and a “less is more” approach to functionality. When Google first launched, its clean interface and simple UX gave it an edge over its rivals’ busy and sometimes overwhelming interfaces. And aside from the uncluttered Google Search, look at Chrome, Google Drive or the Chromebook as examples. The genius of Google lies in its core DNA: the ability to turn complex into simple. Most importantly, Google’s Search algorithm changes over the last 2 years – notably Panda, “Top Heavy” and Penguin have and are still changing the behaviours of a generation of content curators, digital marketers, bloggers and SEOs, forcing them to shift their strategies and focus on audience needs and content rather than unethical black hat techniques to gain links and thus rank. Google has forced us to evolve into an era of owned and earned media – and thank goodness for that! Whilst Google’s hard stance may be considered by some to be too tough and controlling (almost overnight the major algo changes meant many brands lost their top rankings which for some had a big impact on their bottom line), these changes were a necessary evil serving the greater good of searchers and of course brands too. So, yes I admit it, in the greater scheme of things, failure plays a minor role when you look at Google’s successes over the last 15 years. But at least it shows that there are humans controlling the machine!